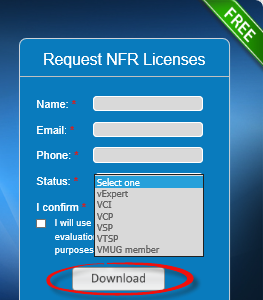 Get free NFR copy of NAKIVO B&R by clicking the [affiliate link] image above and filling out the form, download begins immediately. then you might want to take NAKIVO Backup & Replication 5.7 out for a spin, whether you have spinny drives, SSDs, NFS targets, or any combination. Come on back later to revisit this same article for a video update, my hands-on look at the product in action, kicking the tires in my home virtualization lab. Note that I'll be using my new SuperServer, of course ;-) . Jul 11 2015, video now published below! At right, you'll also see see an image that links to a recent presentation that highlights what's new, in pdf form. Further down the line, NAKIVO B&R 6.0 will probably add backup copy jobs and archiving. I do wish this release was ready a bit faster, as I expressed here on video, given the release of vSphere 6.0 was March 12 2015, nearly 4 months ago. Getting into the beta could haved helped ease that a bit for some, see the 5.7 example here. You may also want to see more articles below, including a list of similar options from a variety of competitors that also cater to the industry-certified IT Professional, including Veeam and Unitrends. Demonstration includes install from OVA, configuration, backup of VCSA, Windows 8.1, and Windows 10, and some successful test VM restores. NAKIVO Backup & Replication v5.7 was released today, featuring full support for VMware vSphere 6 and backup repository encryption. NAKIVO Inc., the fastest-growing virtualization and cloud backup software company for VMware environments, has announced today that it has released NAKIVO Backup & Replication v5.7. The new version provides the full support for the recently released VMware vSphere 6, including support for Virtual Volumes (VVols), VMware Virtual SAN (vSAN) 2.0, as well as support for other new features introduced in vSphere 6. NAKIVO Backup & Replication v5.7 also adds the Backup Repository Encryption feature. Now customers can choose to encrypt the entire backup repository to ensure backup data security. If the feature is enabled, the product will encrypt the repository destination (using ecryptfs for folders and cryptsetup (crypt-md) in LUKS mode for devices/partitions) prior to creating the backup repository. If the encrypted backup repository is imported in another instance of the product, the encryption password will be required to import the repository. Named one of the “Top 10 Virtualization Startups you'll Hear about in 2015” by TechTarget, and one of the “Top 20 Coolest Cloud Computing Vendors of 2015” by CRN Magazine, NAKIVO enables protecting VMware environments more reliably, efficiently, and cost effectively. NAKIVO Backup & Replication is VMware-certified, purely agentless, and can be deployed on both Linux and Windows in a matter of minutes. Featuring a simple and intuitive Web UI, the product can back up and replicate VMware VMs onsite, offsite, and to private/public clouds. NAKIVO Backup & Replication supports live applications and databases, instantly recovers VMs, files, and application objects directly from compressed and deduplicated VM backups, speeds up data transfer with network acceleration, and reduces data size with global deduplication and compression.